Then God said to Noah and to his sons with him: "I now establish my covenant with you and with your descendants after you and with every living creature that was with you - the birds, the livestock and all the wild animals, all those that came out of the ark with you - every living creature on earth. I establish my covenant with you: Never again will all life be cut off by the waters of a flood; never again will there be a flood to destroy the earth." 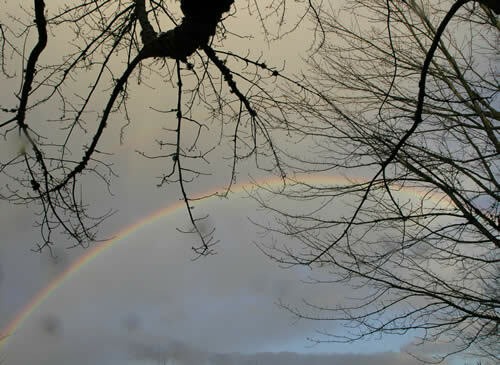 Each time I see a rainbow (not all that often) I am reminded and humbled by God's promise. Sometimes I wonder if He needs a reminder not to wipe us off the face of the planet again... I know, it's a bit of a dark thought - and don't think I'm trying to speak for Him. I know He loves us, but His justice must also be satisfied. One day we will all be judged, and all things as we know them will come to an end. We should be thankful that one of the most repeated descriptions of God in the Bible is: "The LORD, the compassionate and gracious God, slow to anger, abounding in love and faithfulness" (Exodus 34:6, Numbers 14:18, Nehemiah 9:17, Psalm 86:5,15; 103:8; 145:8, Joel 2:13, Jonah 4:2, Nahum 1:3), and the sending of His Son Jesus Christ to die on our behalf, to save us from our retched sins, puts the beauty of the rainbow to shame. 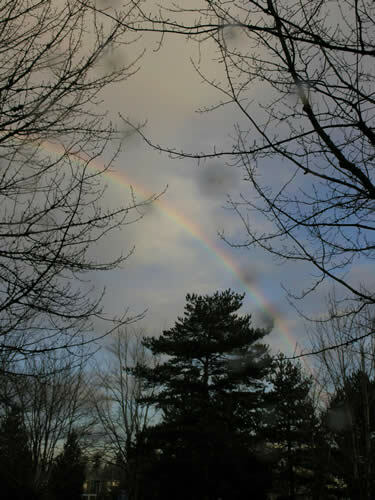 Once again, after the recent downpour of rain, I am comforted by this wonderful promise. Surely God God does not forget His promises, and nor should we. Let's not forget that, no matter what we choose to make this beautiful sign represent or how corrupt we become in our thinking, God Himself says, "I have set my rainbow in the clouds". I often think about rainbows in this way, but what brought this on specifically was the aftermath of this week's flooding in Oregon. And today, appropriately, there was a very bright rainbow in the sky. 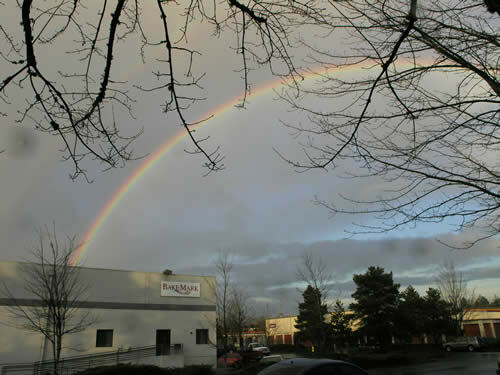 I never have my camera around when I see bright rainbows, and they don't appear extremely often, so I ran outside at work to get a few shots. For some odd reason rainbows are difficult to capture in all their vivid display, but these are easily the best I've personally been able to achieve in my very few attempts. 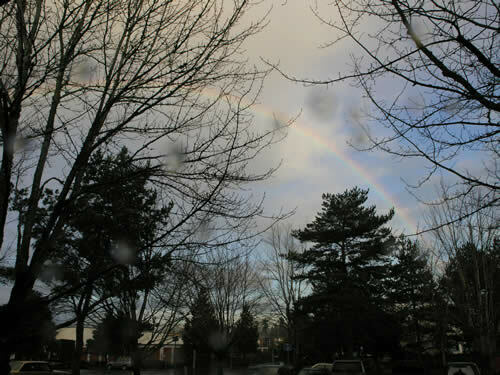 Today's was a very vibrant, full-arc, double rainbow, though my pictures don't do it justice.